What are the most failed classes at USU? Mikayla Kapp photo USU LAB SUPERVISOR JAMES COBURN demonstrates how a vortex cannon works by sending smoke rings across the audience of the TSC Ballroom on Wednesday. Coburn does physics demonstrations at schools across the valley. ble for enforcing the recently amended elections. “We are planning down to the election bylaws. detail,” Frauen said. “That will make A sometimes confusing subthe week so much smoother. We’re ject, off-campus campaigning, was changed to include running a huge apartment buildcampaign for the 4Candidate list, Page 2 ings. But the canelections. Most didate must have of our budget is going toward campaigning for elec- permission from the manager of the tions week. residence and the tenant involved “We hope to raise attendance. We if necessary. If a candidate wants to hope the candidates show up at the hang a large banner or sheet from the events. We’re giving them an opportu- side of an apartment building, the tennity to voice their platform.” ants in that section and the manager Along with planning events like must approve. debates, town halls and banquets, Candidates are also not allowed to Frauen and Baucom are also responsi- use vehicles for campaigns. Kylee Larsen photo BLAIR LARSEN about fault lines in her Monday night GEO 3100 course. 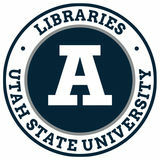 The class is part of USU’s Regional Campuses and Distance Education Program, the only Utah program of its kind ranked recently in a national report. computers. However, the technology has recently seen several improvements. “Because of the technology, there are always new approaches,” Minichiello said. Minichiello echoed Wagner in expressing that the primary benefit of the Distance Education program is the flexibility it provides in earning a degree. In brief Ukrainian PM resigns as protestors dismantle The Ukrainian government repealed its anti-protest laws on Tuesday, the same day Prime Minister Mykola Azarov resigned along in an attempt to subdue protesters. The Ukrainian government now is examining how to deal with amnesty for jailed protesters. President Viktor Yanukovych wants amnesty to be conditional on people leaving public buildings and dismantling barricades. Former president Ukrainian Leonid Kravchuk has warned parliament to “act with the greatest responsibility” with its actions about jailed protesters because he thinks the country is on the “brink of civil war.” Ukrainian protesters said they will not be satisfied until president Yanukovych resigns. Shooter opens fire at Maryland shopping mall A lone gunman opened fire in a shopping mall in Maryland on Saturday. Three people died in the exchange, including the gunman himself. The shooter was 19 years old and was armed with a shotgun and a bag with two homemade explosives that later needed to be disabled. The two victims were Briana Benholo, 21, and Tyler Johnson, 25. They were both employees at a store called Zumiez, where the shooting took place. The motive has remained unclear. Snow, icy conditions shut down Atlanta Just more than two inches of snow fell in Atlanta on Tuesday, effectively shutting down the city. Schools were canceled and businesses were closed In the early afternoon and people went to the streets to head home, buy food and pick up children. Atlanta wasn’t prepared for the snow, so with the icy conditions there was a multitude of crashes and traffic jams on the streets and people were stuck in their cars for hours, almost a full day. Children were stuck at schools and people were stuck in public businesses. Nearly 8,000 students spent the night in school gyms or on busses across Georgia and Atlanta. Syria balks at UN plan for peace Syria’s government has said it will debate a U.N.-backed plan that sets out a way to end the three-year conflict. This is viewed as a “positive step forward” by the opposition. The largest conflict in the peace talks of Geneva has been the idea of a transition process for the Syrian government. However, while peace talks ensue, there are still hoards of misplaced Syrian refugees. The British government said Wednesday they will take in hundreds of the “most vulnerable” refugees from Syria. The U.K. is just the most recent to accept Syrian refugees as other countries across Europe have already agreed to take in some refugees. The U.S. is the only country not putting a limit on the amount of refugees they take in while Germany has the highest limit, agreeing to take in up to 11,000. There’s been some changes that, without (myVoice), I don’t think we would have heard of them. Online From Page 1 Josh Mason, a sophomore in mechanical engineering, said he benefited from this increased access. As a father of six kids, his close proximity to the Brigham City campus has been a part of his success. Loy Andrus photo A MEMBER OF “MY BAD CREW” demonstrates his skills with other members of his break dancing team Monday night in the Taggart Student Center International Lounge. They have performed at various events at USU. Mikayla Kapp photos JAMES COBURN shows how electricity can be transferred through the air by holding up a metal ball on a wooden stick to the Tesla coil built by USU physics students at the demonstration show Wednesday in the TSC Ballroom, left. Right, Coburn demonstrates how flammable hydrogen is by holding a torch to it and causing it to explode in the balloon. He compared it to a helium balloon, which did not have near the theatrical effect. Physics From Page 1 Serbian-American inventor Nikola Tesla, are a special circuit invented by Tesla in 1891. They are often used in educational demonstrations to show how electricity transmits wirelessly. The coil is always a hit at demonstrations, said Jacob Dansie, a member of the Society of Physics Students. Dansie and the club assists with the valley demonstrations and helped build the coil used by Coburn. “Tesla’s pretty much the father of modern society as we know it, at least modern industry,” Dansie said. “He did three-phase induction, built brushless motors, which you find in everything. Check out the rest of Science Week Science Week continues today with drop in resume editing and taking professional pictures from 9-11 a.m. at USU Career Services in the basement of the University Inn, Erickson said. That evening, the Science Council will honor students in their college at an invitation-only dinner. On Friday, students can come write thank you notes to science professors from 8 a.m. to noon in buildings with science classrooms across campus, she said. That night, elemental bingo, based on the periodic table of elements, will be held from 7:30-8:30 p.m. in the Engineering building, room 103. The week will end with a dance in the Health, Physical Education and Recreation building gymnasium from 8-11 p.m. Students are free with their USU ID card, and the first 150 attendees receive free sunglasses. This year, Chinese New Year begins Jan. 31 and ends Feb.18, 2015; according to the Chinese calendar, it is the year 4712. Loy Andrus photo illustration USU STUDENTS listen to a professor lecture during a class. Around 600 students take MATH 1010 and MATH 1050 each year. Course: Failures: MATH 1010 5,679 MATH 1050 4,535 ENGL 1010 3,703 PSY 1010 2,776 USU 1330 2,284 USU 1320 2,177 ENGL 2010	2,105 MATH 1100 2,024 STAT 1040 1,909 BIOL 1010 1,908 Many of the USU’s most-failed classes over the last 13 years have been general education classes. As I researched all of these tunes, I started kind of trying to put them in an order that kind of tells a story. Photo courtesy of Mark Sheldon Photography USU’s COREY CHRISTIANSEN, guitar professor, played in Chuck Owen’s record “River Runs,” which was nominated for a Grammy. after such a declaration of love. The book ends with our heroine and hero finally off to have that game of chess they’ve meaning to play throughout the whole book. Sigh. A high school classmate and teacher referred me to the book. That classmate told me it was all she could think about after reading it. Working at Great Harvest Bread Company was hard for her because her mind was on the book. Now, I can relate. All I can think about is how different it is. Finally, the main character isn’t in some faraway place like London. Finally, she’s relatable to me. She does some embarrassing things, and of course, she finds someone who thought her embarrassing acts were endearing. The main character Marianne could, in fact, be relatable to everyone. She struggles with the death of her mother, the absence of her father and comparing herself to her outgoing, beautiful twin sister. She struggles with not having the accomplishments society expects of her. Her weakness of believing rumors is something not unheard of today. She jumps to conclusions. But in the end, she’s smart and loyal. She’s a good person, and she tries hard. This story sure was an emotional rollercoaster though; not in the a physical-tears-down-face way “Les Miserables” or “War Horse” did. Its style is more of a smiling-ridiculously-and-squealing-to-yourself then switching to saying, “Oh, no,” and being thoroughly worried about what’s to happen next. Ultimately, it was really difficult to contain my excitement, enthusiasm; what have you. I couldn’t put the book down. I was enthralled; still am, actually. I was up reading it until 1 a.m. Monday morning. Was I tired? Yes. Was it worth it? Yes. Would I do it over again? Duh. Delayne Ripplinger photo HEAD COACH STEW MORRILL REACTS TO A PLAY during USU’s loss to San Diego State on Saturday at the Dee Glen Smith Spectrum. The Aggies suffered an overtime loss to the then-No. 7 Aztecs. a little bit. I’m not throwing any of our players under the bus. It’s my fault when our guys don’t play hard enough.” The Aggies did have a win against Colorado State, an NCAA Tournament team last year, at home on Jan. 15, but that was their last win. They have now lost four-straight games: at Boise State, at UNLV, to San Diego State and to New Mexico. Their average loss margin has been 10.5 points in those games. “We’ve just got to pull together. I mean, we have two choices: You can lay down and give up, or you can just keep fighting,” said guard Spencer Butterfield after an overtime loss to San Diego State. “The good thing about this team is that we keep fighting and we are going to keep fighting the rest of the season, and we are going to bounce back.” The Aggies will try to get their first road win in 2014 on Saturday against Wyoming and will try to snap their four-game losing streak. is the better “ Nick athlete. He’s always had that gift. He’s a lot more athletic than I am. Delayne Ripplinger photo NICK VIGIL AND ZACH VIGIL eye a Wildcat ball carrier during USU’s win over Weber State on Sept. 14 at Romney Stadium. ball as he posted more than 120 tackles. Zach, a very vocal person, seems to have all the qualities coaches look for in leaders. He drew rave reviews from USU defensive coordinator Todd Orlando. Brothers From Page 6 “Zach is as professional as professional gets in terms of preparing for the game, understanding assignments, being a leader,” Orlando said. “If you could bottle that up as a coach and be able to use that as part of teaching, that would be awesome.” Looking back to when Weber State didn’t offer him a scholarship, Zach equated his feeling today to a Garth Brook’s song “Unanswered Prayers,” which describes how some of the best prayers are the ones that go unanswered. Considering the 70-7 bashing Weber State took from USU this past season, it definitely seems like it has all worked out for the better. As for Nick, it was his offense, not defense, that shined throughout high school. Nick shredded defenses in prep football at Fremont High School where he amassed more than 3,600 yards and 45 touchdowns as the star running back. “I actually didn’t play defense all through high school until senior year when I played safety,” Nick said. Due to his speed and athleticism, USU moved him to outside linebacker once he was in Logan. Despite the unfamiliarity with the position and defense in general, Nick’s ability was obvious to the coaches. “As he started to develop in fall camp. We started to see his playmaking ability,” Orlando said. “He’s got great wiggle, and he can get around people and find the football.” After a redshirt year, the plan was to bring Nick along gradually this past season. win, sealed by Adam Vinatieri’s game winning 48-yard field goal. 7. X: Pittsburgh Steelers 21, Dallas Cowboys 17 This was the first of the many meetings between the Steelers and Cowboys in the Super Bowl. It featured two great quarterbacks, Terry Bradshaw and Roger Staubach. Staubach led a late game comeback that came up short. 8. XXXII: Denver Broncos 31, Green Bay Packers 24 This was when John Elway finally won his Super Bowl. He had failed on his first three attempts, but in this Super Bowl he beat Brett Favre. Historically one of the the best quarterback matchups in which a running back, Terrell Davis, won the MVP. 9. III: New York Jets 16, Baltimore Colts 7 The Jets did not get much of a chance going into the game, but Joe Namath guaranteed a win. The Jets went up by 16, and Johnny Unitas could not bring the Colts back. The Jets have not been to a Super Bowl since. 10. XLIV: New Orleans Saints 31, Indianapolis Colts 17 The Colts were in a prime position with one of the best quarterbacks, Peyton Manning, to come back and tie the game. Manning was 26 yards away from tying the game when Tracy Porter picked him off and took it all the way back for a touchdown to seal the game. – Jeffrey Dahdah is a sophomore studying statistics and journalism. He is a die-hard Cardinals, Rams, Jazz and Aggies fan. He loves sports statistics and loves using them to analyze a sports and prove his points. If you have something to say to him, feel free to email him at dahdahjm@gmail.com or tweet at him @dahdahUSU. State your case: Will the No. 1 offense or the No. 1 defense emerge victorious in Super Bowl XLVIII? Is there any doubt it’s Denver’s year? You’ve got a twotime Super Bowl champion running the franchise he won those rings with in John Elway. Leading his team his a future Hall of Famer and one of, if not the greatest quarter- Lundstrom backs, in NFL history in Peyton Manning. At Manning’s disposal are three of the league’s most prolific receivers in D. Thomas, W. Welker and E. Decker. And don’t forget tight end J. Thomas, as well as running backs K. Moreno and M. Ball. Manning — the smartest quarterback in league history — just has too many weapons for even Seattle’s No. 1-ranked defense. Denver is going to put up 20-plus points; they’re just too versatile. So while everyone else will be watching the No. 1 offense vs. the No. 1 defense, the game is going to be decided by the way Seattle’s offense performs against Denver’s defense. In two playoff games, the Broncos have recorded six sacks, allowed just 129 total rushing yards (64.5 per game), 450 passing yards (225.0 per game) and 33 points (16.5 per game). Let’s compare that to Seattle. In two playoff games, Seattle has three sacks, allowed 269 rushing yards (134.5 per game), 456 passing yards (228.0 per game) and 32 points (16 per game). So all things considered, it’s hard to argue against Denver as the better allaround complete team. Throw in a couple of X-factors like age — Seattle has zero players with Super Bowl experience — and location — MetLife Stadium isn’t CenturyLink Field — I just can’t see Seattle claiming its first ever Lombardi Trophy. Peyton Manning and Russell Wilson both rank in the topfive in long passing plays this season, but Denver’s defense has given up 37 passes of 25 yards or more this year, good for eighthworst in the league at defending the long jones ball — bad news for Broncos fans. Seattle’s defense has held teams to just a little more than 14 points a game this season, and they’ve done it with physicality and pressure unmatched by the rest of the league. The Seahawks give up the fewest passing yards per game, the fewest total yards per game and the fewest big plays of 25 or more yards per game — just 15. Seattle’s secondary is an interception machine, totalling 28 this season. Though Manning will undoubtedly do his best to study Seattle’s defense, the pressure the Seahawks attack with will force him to make snap-decisions — one of the reasons the Seahawks force turnovers on 20 percent of their opponents’ drives, another league-leading mark. Manning had zero interceptions and wasn’t sacked in the AFC Championship game and wasn’t sacked once. Unless he’s suddenly become a mobile new-school quarterback who can pick up first downs with his legs, those stats won’t be repeated against Seattle. On the other side of the ball, Russell Wilson will benefit from the return of speedy wideout Percy Harvin. Denver’s defense will be forced to risk either single-covering the oft-injured Harvin or collapse its defense around him, leaving open opportunities for Harvin’s teammates downfield. Defense wins championships. All time, league-leading offenses are 10-8 in the Super Bowl — league-best defenses are 12-3. Samantha Behl photo ZACH VIGIL, LEFT, AND BROTHER NICK VIGIL, RIGHT, discuss playing together on the USU football team. Both play linebacker and have had an impact for the Aggies. That support from the Vigil family was on display all season, with a family appearance on the jumbotron being a sure bet for winning best tailgate picture. “They win the tailgate thing pretty often,” Zach said. very tight-knit family, sometimes keeping a healthy distance away from each other is best for everyone. “No, I’d kill him,” Nick said of living with Zach. “We actually live like four houses apart.” Zach echoed that sentiment. “It’s close enough but far enough,” he said. “He stays sometimes with me in the summer because I keep my lease all year and those few weeks are … very long.” And who is best when it comes to getting dates? “Nick does,” Zach said. “Nick always gets all the girls, ‘Look how cute he is.’ When you’re better looking, faster, leaner; who doesn’t want that?” Nick had different feelings. “Oh God. They want biceps. Zach has got the biceps,” Nick said. The Utah legislative general Andy Pierucci session has begun. It’s such an exciting time of the year for Pierucci’s a political sciPolitics ence nerd such as me. It is also an important time for every citizen of Utah. I encourage everyone to keep updated on the bills discussed for the next month. If an issue comes up that you are passionate about, contact your legislators. Our state representatives and state senators are surprisingly accessible. They sincerely want feedback from their constituents. Please email them or write them, follow them on Twitter and friend them on Facebook. No fewer than eight USU/SA candidates are Tavin Stucki running unopposed for office this year. This means $44,800 in free scholarship money is being handHail ed out because there to simply wasn’t any other the interest. That’s money parChief tially funded by the student fees you and I pay. That disgusts me. But, we can still do something to fix it. Don’t let these candidates run by themselves. The deadline to declare candidacy was Monday, but write-in canTavin Stucki didates may register until 4:30 p.m., Feb. 18. I often hear complaints from students about not knowing how to get involved on campus. Well, here’s the best opportunity possible. Have you ever had a complaint about the Howl? Have you ever wondered why few big-name bands perform at USU? Are you upset the student section at basketball games hasn’t been as good as in the past? Are you frustrated that alcohol is prohibited on campus, even at sporting events? Are you upset that minorities don’t receive enough of a voice? The positions with only one candidate running are the positions that actually have the power to do something about those commonly heard complaints: Student Advocate, Programming, Athletics and Campus Recreation and Organizations and Campus Diversity vice presidents, as well as arts, education and human services, graduate studies and science senators. Some of the people walking into these offices are more than capable of doing a good job. I’m not so sure about others. Either way, having competition raises quality. Think of it this way: How much better do you think The Statesman would be if there was someone behind me clamoring for my job and saying they could do it better than I can? Androids would be awful phones if they weren’t trying to beat the iPhone. It’s the same for anything, including student government. This female version of the American success story seems compromised. I “ Personally, don’t have a dog in this fight: I’m graduating. . . But if I were you, I would be pissed enough to do something about it. ders signed by Obama since 2009 — compared to George W. Bush’s 291, Ronald Reagan’s 381 and Richard Nixon’s 346 — the process is nothing new to the administration, but now such actions are more crucial than before. His No. 1 responsibility is to the benefit and prosperity of the American people, and he is obligated to use whatever means necessary — be it bipartisan agreement or circumvention of Congressional Republicans dragging their feet — to ensure the country breaks free of alltoo-common stalemates. Many of Obama’s potential executive actions would make a difference, but none so noticeably as a raised minimum wage. While it might be thought that raising pay for federal contract workers to $10.10 per hour only benefits a small percentage of citizens, such an action places pressure on other types of businesses to also increase their employee wages, adding incentive for increased productivity and workplace morale. Rep. George Miller, D-Calif., and Sen. Tom Harkin, D-Iowa, have worked on a bill to extend this minimum wage raise to the rest of the country, Obama said. over past marital troubles. (Newt Gingrich, anyone?) However, the criticism of Davis as a bad parent has sexist elements. In the New York Post, columnist Naomi Schaefer Riley argues that Davis has no political future because “a woman who leaves her kids is just beyond the pale,” in the eyes of men and women alike. “Call it sexism if you want,” writes Riley, noting that mothers who don’t have custody are automatically suspect and making it clear that she’s fine with the double standard. If nobody else gets it, I don’t really care. But I get it. I live in a dive one-bedroom apartment with extremely low rent, eat ramen noodles and keep my furnace as low as It can go before I turn into an ice cube. “This will help families. It will give businesses customers with more money to spend,” he said. “It doesn’t involve any new bureaucratic program. So join the rest of the country. Say yes. Give America a raise.” In Utah, this would mean a raise of $2.85 per hour from the current $7.25 minimum wage. While this isn’t the gain many Democrats hope for, it’s certainly not the economy-breaking figure most Republicans have imagined. While working my last non-journalistic job — $9.25 per hour, 40 hours a week — I often couldn’t make ends meet from month to month. The Zion curtain is also an economic burden upon Utah’s small businesses. nationally in the next four months when his schedule at USU allows. He’ll be touring and performing cuts from “Lone Prairie” in cities throughout the nation during the summer months. But even while he’s promoting “Lone Prairie,” Christiansen said he has been working on material for future releases. “I’m getting some music together, and I’m kind of torn between two projects,” Christiansen said. “I’ve got another record that’s kind of a concept record. I’ve been writing music for a couple years now and I think I’ve got enough tunes to do the whole record, so I’m thinking about recording that. But I’ve also been doing a fair amount of arranging of Jimi Hendrix tunes for my group, so I’m thinking of doing a Hendrix concept record. It’ll definitely be a jazz-rock kind of record, and I guess it’d be fair to say if people like jam-band music, they’ll like the next two projects that will be coming out eventually.” I live in a dive one-bedroom apartment with extremely low rent, eat ramen noodles and keep my furnace as low as It can go before I turn into an ice cube. I don’t have a drug addiction or gambling problem, I just couldn’t make that a living wage. I built up credit card debt and borrowed money from my folks, two things that cause another set of problems entirely. It’s these types of issues college-age Americans face every day. Many of us come out of this institution with thousands of dollars of debt, only to land a low-paying job that causes us to choose between eating and paying that student loan bill. Midterm elections are just around the corner. I’m hoping Congressional representatives will decide they really do value their jobs and, more importantly, value their constituents. It’s time to start improving these conditions so the American dream isn’t just about surviving any longer. If Congress won’t compromise and take action, I’m confident this rejuvenated Barack ‘n’ Roll has got it covered. tion), and that’s why we have SI. They are the classes most populated.” Tolman said another resource for students struggling with classes are specialists in the ARC. She said she is the one who figures out where students are failing and then picks a specialist. She said it varies how many times students meet with specialists. She said some meet with her and decide they don’t need to meet with a specialists, while others meet with specialists as many as 12 times. The ARC has learning specialists over different areas, Toman said. Dennis Kohler is over math and statistics, Su Lin Nelson is over test anxiety and Debi Jensen is over SI and reading. “Take advantage of SI and program tutoring,” Tolman said. “Take advantage of what is available.” She said PSY 1730 is a seven-week class that the learning specialists teach, which teaches everything students would learn if they went to the ARC in a more in-depth manner. She said it’s worth three credits and lasts an hour and a half to two hours. She said it is recommended for freshman, nontraditional students or those who are just struggling. Chief From Page 8 Do you really want to be stuck with the decisions of someone who walked into office, received a full-ride scholarship and was paid to go to school, just because nobody cared enough to campaign against them? Personally, I don’t have a dog in this fight: I’m graduating this May and won’t be here to reap the rewards or failures of the 2014-15 student government. But if I were you, I would be pissed enough to do something about it. – Tavin Stucki is the editor in chief of The Utah Statesman. His articles have won awards and appeared in numerous news publications throughout Utah. 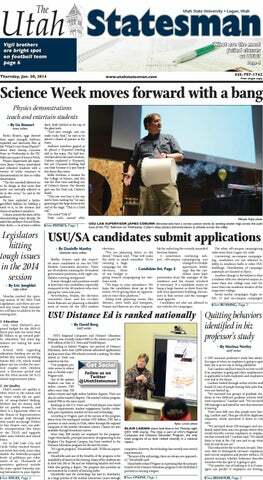 Send any comments to statesmaneditor@aggiemail.usu.edu. – Paul is the former features editor of The Utah Statesman and is a senior majoring in print journalism. Send any comments to paul.r.christiansen@aggiemail.usu.edu. take action. Email your state representative and state senator. Let them know your thoughts. We as citizens must play an active role in government. The bills discussed and passed for the next month will affect our lives. – Andy is a senior majoring in political science. He is currently the vice president of USU Pi Sigma Alpha, a member of the GRC, the Secretary of the Utah Federation of College Republicans and president of USU College Republicans. dren from their mother.” And, with a few exceptions, feminists have supported this double standard when it favors women. They have portrayed career women who lose custody as victims of misogyny, opposed joint custody legislation, and even compared fathers’ rights activists to abusers. Let’s oppose sexism across the board. Women should not be judged more harshly for spending less time with their children; they also should not be presumed the better parents. – Cathy Young is a regular contributor to Reason magazine and the website RealClearPolitics. She wrote this for Newsday. Today is Thursday, Jan. 30, 2014. Today’s issue of The Utah Statesman is published especially for Erik Rodriguez, a freshman majoring in business administration from Layton, Utah.